shop local | What's on the Menu? The Holiday season is upon us Stamford and what better way to Keep it Local than to shop and support local?! While by no means is this meant to be a complete list, I’m hoping that this will give you ideas on where to shop with the focus being small and family owned businesses. Please note that no compensation was paid to get on this list. You’ll find everything from jewelry and gift shops to spas and salons and even package stores (for a touch of the holiday ‘spirit!’). So whether you’re looking for something handcrafted or a gift certificate to get the hair and nails done, hopefully, you’ll find something here. PLEASE NOTE: at the end of the list, you’ll find ways that you can shop and help to support and keep WOTM going at the same time. The Funky Hippie Wellness and Gift Shop: 101 Glenbrook Rd.– Handcrafted items by local artisans, crystals, oils and more. Friends Book Shop @ Ferguson Library: One Public Library Plaza Downtown — Books from every genre including local history, now includes a pop-up shop in the former Starbucks library location and they offer book baskets and gift certificates! Same hours as the library so head on down! Heart of Gold Fine Jewelry: 930 Hope St. — Handcrafted items including jewelry as well as home decor, candles, ornaments, ceramics and more! Big Dreams Gallery: 96 Franklin Street — From the guys who brought you Big Dreams Tattoos (located on Bedford Street), Big Dreams Gallery has raw, unique art from local talented artists that range from HipHop to Marvel and so much more. You never know what you’ll see here and they also do arts shows and paint nights! Pacific Cycling & Triathalon (and Cafe!) 984 High Ridge (across from Trader Joes) — Have an athlete on your list? Check out the gear here or grab a gift certificate. United House Wrecking: 535 Hope Street — A Stamford icon, you can find big and small items here and the more unusual the better! Stamford Toys: 970 High Ridge Road (behind FEDEX) — Why go to the big stores when you can grab a new favorite toy at this Stamford legend? Great finds for all ages here. Noelle: 1110 High Ridge Rd. Crazy Grapes: 491 Hope St.
Stamford Magazine: Give the gift of a subscription this year. Half Full Brewery: Grab a shirt, a glass and more. Stamford History Center: Give a membership, a Stamford at 375 DVD or check out their bookstore to find a hidden gem. WOTM on CafePress: From shirts to mugs to puzzles and more–each link has a different WOTM theme. Perfect for showing some Stamford pride and great for those away at college to remind them of home, these are the official WOTM shop pages. Note, these will be closing up shop in 2019 so grab the goods while you can! Great ways to KEEP IT LOCAL STAMFORD! 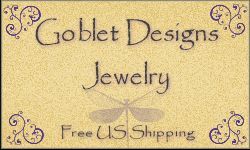 The Goblet on Etsy: For 19 years I’ve been creating handcrafted jewelry. Now in my Etsy shop, I sell not only my handcrafted items but also vintage pieces. All items created by myself are one of a kind and what may be there today, may be gone tomorrow! Be sure to follow my shop on IG: Instagram.com/gobletdesignsjewelry for info on sales, new pieces and more. Free US Shipping and Free Gift Pouch with each item. Stamford Books: Great as gifts for the person who wants to learn more about where they live. Note each purchase done through this site, helps support it. Thanks so much all and remember to support our local businesses…they keep Stamford going! !